Caitlyn Larsson is a jack of all trades, and attempting to become master of a few. She is a flying trapeze and aerial artist, who moonlights as a travel and content writer in her spare time. She received a BFA in theatre and education from New York University and after a brief stint as a professional tour director (If you look out the right side of the bus, you'll see the Statue of Liberty), she discovered and fell in love with circus. 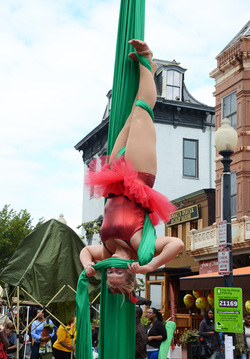 After sprinting off to England for some whirlwind training at Circomedia in flying trapeze, aerial arts and acrobatics, Caitlyn became a roving circus vagrant, traveling the globe performing and teaching. Quickly realizing that the wandering circus lifestyle is not always the most lucrative or stable, especially when attempting to keep up with those pesky NYU loans, she fell back on her impeccable grammar and highly praised writing skills to help pay the bills. Now, with a 'work hard and smart' work ethic, Caitlyn balances out her life as a teacher, performer, director and writer with grace and dignity, and only a few harried late nights. She can be found teaching workshops and performing original circus acts around the world, all the while enjoying the freedom of writing on the go. She spent 2 years in San Juan, Puerto Rico, employed as the new rig manager for Trapeze School New York, crafting shows for Bahia Urbana in Old San Juan, helping with the inaugural International Circus Festival in PR, and plotting ways to bring Clowns Without Borders to the island. She took some time to galavant around Fiji and New Zealand, attempting to surf and teaching workshops to locals. There was a stint in San Francisco, meeting colorful West Oakland locals, and the direction of a full length circus show in Dallas before fleeing the country for some rest, relaxation and more workshops and performance in SE Asia and Australia. Currently she can be found in Melbourne, studying exercise science by day and moonlighting as Marilyn in her one woman comedy show at night. We hear your call, aerialists, and have printed more items that circus folk should love. The max number of any item is 3, which means almost every piece is completely unique. Inquire on facebook, or email areyoufittofly@gmail.com .